It’s officially here; my admission to the partial hospitalization program is tomorrow. 10:30am. To be honest, nothing feels different, scary, intimidating or anything like that when I think of treatment tomorrow. It just feels surreal. But, I know that once my alarm goes off (assuming I actually sleep tonight) that will all be different. I sit here, not nervous but the thought of tomorrow starts to stir up the fears. It’s normal to be nervous. I know. That’s what everyone says. But there is nothing normal about this. There is nothing normal about having to drop out of school this term, to be going to a treatment center, to be going to one where I will be there 8 hours a day and be supervised during the entire time, there is nothing normal about having to stop working to go to treatment, there is nothing normal about crying around food, nothing normal about having side effects all the time, nothing normal. But crying around food, not eating, the side effects all of that ED related stuff, it’s what I know. It’s normal to me. And I guess that’s precisely why I am dreading tomorrow, because when normal is yanked out from under you it’s never an easy landing, never a flawless execution, and nothing ever ever goes like people plan. So yeah, tomorrow is the day. On top of that I am beyond stressed about not knowing what will happen, what to expect and what the whole situation will entail. I just wish someone could be like this was my experience “i did x first and y next and z then and blah blah blah.” But I can’t find anything online like that so I am stressing about that. And of being weighed. I am extra stressed about that part. The anxiety over the minute details and new situations is so much worse these days. Since these stupid anti-depressants were prescribed I am always stressed. Always worried, always feeling like I am overwhelmed and on the verge of panicking. I hate it. I need to talk to my doctor about it but I just haven’t really been able to get there- because I am nervous about it. Go figure. Plus they make me not want to be around anyone. Not even myself some days. Whatever. I have good days too so maybe those will start to outweigh the odd ones. I did drive to the center on Saturday- when they were closed. I parked in the parking lot and tried to piece together and mentally prepare for what is going to happen tomorrow, how I am going to get the confidence to go in, how I am going to open the door, say the words, and well, actually just go through with the whole thing. I’m still not sure I can do it. I wish I could’ve gone to see my ARNP beforehand. She always says something that makes me feel like I can do this, like I am not alone, like it’s okay to be freaking out and honestly, I trust her so I can tell her and plus, I know it’s told in confidence which is relieving. These people at the treatment center, I don’t know them. I sure as heck don’t trust them and I can’t just open up to people about feelings. I’m not that kind of person. I’m not comfortable with that. I’m not going to do that tomorrow. Secretly, though, my absolute biggest fear is that they are going to give up on me. Or, that I am going to trust them and then have their help yanked out from under me for one reason or another. So, tomorrow. 12 hours, actually. 12 hours until this really becomes…. real. I am scared when the treatment center starts forcing me to eat that my body (and brain) will remember food and that I won’t be able to stop eating. I just don’t have words anymore. 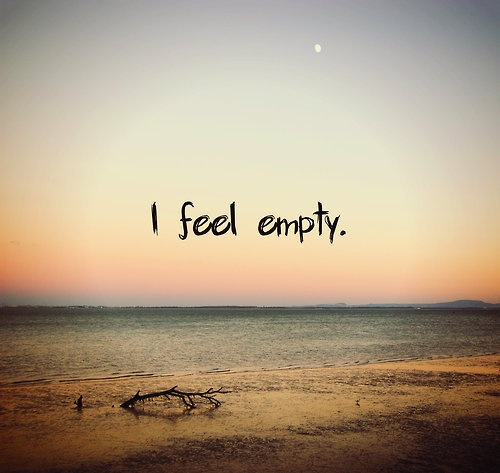 I feel empty. Pure emptiness. I don’t want to be with people; I don’t want to be alone. I’m not happy; I’m not sad. I don’t want to be awake; I don’t want to lay in bed. I’m not lonely; I’m not overwhelmed. I want to cry; I don’t want to cry. I want to confide in someone; I don’t want to confide in someone. I want to live; I don’t want to live. I just don’t know what to do. I have to go see my doctor on Tuesday but I feel like I shouldn’t say anything because I don’t want to be a burden and I already have enough issues for them to worry about. I don’t even know what’s causing it, I mean life has just become so unraveled since I spoke up about my eating disorder. I have had to officially give up my marathons and completely stop running, drop my fall semester classes because PHP will prevent me from going to classes and the doctors said to medically withdraw from the term, I have had to tell people, i had to stop going to the gym. dealt with the stress of getting into a treatment program, go to the doctor weekly, start new medications and deal with the stupid side effects. Maybe I am just over stressed. Maybe it’s the new medicine that is making me feel like this. Maybe it’s just in my head. Maybe it’s anything. Maybe it’s nothing. I’ve just never felt like this before. Ever. Not even when I was alone in my struggle with this eating disorder but now I can’t get rid of the emptiness and I don’t know what to do to make it stop. The one thing I do know: I am losing myself. I am barely inside anymore. I am just a shell of who I used to be but the fire inside me, my soul, my self is smaller and farther away than ever; and I’m not sure I can get it back. Yesterday I was worried, immensely worried, about telling my podiatrist about my eating disorder (I feel so old having a podiatrist hahah). I am still really, REALLY uncomfortable saying it out loud to people who don’t already know- probably has something to do with the perfectionist part of me which also helped ingrain this beast in the fibers of my being. But, I had to tell him because my feet are almost always numb, my injuries have been less than healing and I get oddly injured a lot. (Part of getting injured a lot is just the real me, I don’t really always stop and think when I am deep into my bazillion of activities but not all the injuries are accountable from that). Fact: When I told Dr. C, he looked at me and said “you know, that’s actually a LOT more common than you think” and told me if he knows anyone who can beat this and get better it’s me. Hey, ED: YOU WERE WRONG. He didn’t judge me, he didn’t even flinch, he cared, he showed compassion, he didn’t think I was crazy, he didn’t treat me differently, he didn’t do anything other than be immensely supportive. He told me to call if I needed anything even if it wasn’t related to my feet, he told me that if the treatment center needed anything to just call and he will get it done, he told me I CAN SURVIVE THIS. He joked with me, he made me feel comfortable and you know what, ED, YOU WERE WRONG ABOUT IT ALL.ALL of it, ED, because you know what? HE PROMISED HE WOULD STILL FIX MY FEET SO I CAN RUN. Although he said I need to continue to take the time off that I’ve been doing, especially when he realized how sick I am and when I told him the complications I am having. But he promised he would still get me back to my marathons. And I trust him. I trust him more than any other doctor (although my Nurse Practitioner is an angel and I trust her too now, Dr. C was the only doctor I trusted for a very very very long time). So moral of the story: My ED is NOT always right, and I’m starting to think maybe it’s wrong more than right (?) Dr. C and my Nurse Practitioner are medical professionals and neither have taken my fears and dismissed me or them, they’ve done the opposite and have both showed genuine human concern, not just the your-my-patient-I-have-to-“care” disposition. And telling Dr. C was a HUGE relief, I trust him enough to know that no matter what I can count on him to support me, get me back running and to not treat me differently (my biggest fear). Also, My mom and sister were right (PS. Totally making a post later about my AMAZING little sister, we are best friends and she was texting me when I was nervous yesterday and made me feel infinitely better). Still, you never know how people will respond but what I am starting to learn is the people you have in your life that are worth telling also think you are worth enough to be alive, happy and healthy and when they realize you need help and support it is instinctive for them to stand beside you and help you get there. So, Dr. C. if you ever read this: Thank you. You put the awesome in awesomesauce and are perhaps the best doctor I have come to know. Best runner compliment ever: made. my. day. but your reaction to my eating disorder was exactly what I needed and for that there are no words that can express my gratitude. PS. When I make my running comeback: get ready because I am aiming for… an ULTRA and a Triathlon!!!! One day I’d like to be able to go to the doctor without crying about it for a week because I am so scared of getting on the scale and what I’ll do if it goes up. Maybe it’s a double standard or me being overly dramatic (a word that has never been used to describe me) but on Tuesday I picked up a letter from my doctor to clear me medically for an ED treatment program and as I read the letter it was like being punched in the gut. Why? Not because the letter was mean or harsh or anything like that but rather it was because of the words ‘eating disorder’. They were used as a description and it was like this whole thing went from “an eating disorder” to “her eating disorder”. My eating disorder. MY. MINE. Like it is officially a part of me and honestly, I am not sure how I feel about how raw and real that is. Now, I have (countless) times written on here I have an ED, used the words and typed them into Google but until 2 weeks ago I hadn’t ever said the words out loud and actually, when I came clean with my doctor I didn’t even say “eating disorder” I just described my actions and thoughts. Telling my best friend on Monday (last week) was the first time I ever said “I have been diagnosed with an eating disorder” but even then it was an illness, an invader, a foreigner. But “her eating disorder” just makes official that this is my disease, I have this, it is inside me, tearing me apart. It’s no longer a third party but rather it is ingrained in me, has become part (or most of) who I am, and is officially no longer something I can just brush off as me being a “hypochondriac” or “not sick enough for”. And that’s a hard pill to swallow ( and worse than that terrible liquid potassium chloride I had to take yesterday bc of my terrifyingly low potassium levels). I mean it’s not like I wasn’t expecting those exact words in the letter because tbh, of course I was. I mean I have an eating disorder I’m not delusional about everything but still I still feel scared, raw and vulnerable. Vulnerable is the worst. I think seeing it also solidified that I am going to have to start using it to describe myself in relation to my health. This will have to start sooner rather than later too and not just with the treatment center (who I have also managed to only say those words out loud to once as well) but also because next week I have to go to my fave doctor (totally serious). He is my amazingggg podiatrist and seriously I am a bazillion percent sure my feet would’ve been goners a longggg time ago if not for him, especially since I took up running lol. But he entertains all my wacko thoughts and ideas, like when he put me in a cast and I told him how I was going to finagle it so I could still skydive 8 days later (which I did successfully!). But I trust him enough to do surgery once and treat all my injuries well enough to keep running and now that I am facing surgery again for a different issue I know he needs (and deserves) to know. Plus, some of the extra issues I’m having are things dealing with my feet (constant numbness and my mom thinks the heel agony is bc of my calcium deficiency). But still I hate feeling vulnerable and I am still not comfortable with sharing that with anyone much less being the person saying the words eating disorder to describe me. But I have to because I know I need to and my appointment is next week. I also have an appointment (again) with my primary doctor on Tuesday just to check in, do more lab work and make sure I am making headway in the admission to a treatment center (which I am). I am going to ask her just in case she says I don’t have to tell my foot doctor (which I doubt more than anything in the world) but still, I’ll ask. And hopefully, seeing her and being able to talk everything over will somehow help me get to the point where I am comfortable with telling another person about what’s going on (even though I know it is for the best, he will help too and that it is “okay” to ask for help). So yeah, that’s where I am at. Not really sure where the post was supposed to go but I guess it was more of a ‘talk it out’ post since I can’t run right now and that’s normally where I have my ‘talk it out’ time within myself. When I eat and the hunger goes away even a little I always feel like I have overeaten, like a failure and then when the hunger comes back I am always relieved and more relieved the sooner it does. This is one of the things I hate the most. This exact time last week I was crying in the exam room. I was confessing my biggest skeleton in the closet, my long held secrets, fears and spilling the beans on everything I have come to know in my life. The first time the words eating disorder were associated with my name, the first time I heard the words treatment center uttered in relation to who I was, the first time in my life I was unable tell my mom something. What has changed in the last week? Nothing, really. I still abide by my ED habits the only difference is now my mom, 2 sisters, best friend, doctor, random guy at the treatment center and (as of this morning) one of my aunts and uncles knows. I have also had an emotionally charged week, at least that would be putting it nicely. For the first time in a longggggggggggg time I have expressed my feelings to my mom (ending in a MAJOR blow up last night after I posted). I know everyone is trying to help but sometimes telling me that I need to do something (try harder, change my thoughts, etc.) is just not helpful especially because that is WHY I asked for help. I still am waiting on a call from the doctor today about what I am supposed to do to get medically cleared for treatment in PHP or IOP. I am praying that I actually can get cleared and I don’t have to do inpatient. I don’t even want to think about that right now. But ultimately, the last week has been this odd place to be. It’s like living the life of an ED without the secrecy. It’s strange, really. People encourage but don’t push me. I don’t think they know quite how to help and I certainly have no idea what to do so I just keep trudging along. Hopefully I hear soon. I want to be done already. I’m tired of wandering around between the world of eating disorders and the world of recovery, I am scared the eating disorder one is pulling me back in by the day, slowly suffocating me back into the depths of the disease and far away from those trying to help me.